The Blue Angels are a team of 16 top Navy and Marine Corps jet pilots who, after a rigorous, highly competitive selection process, voluntarily serve two to three years with the squadron touring each spring and summer. At the end of this time, they return to their fleet assignments. Every year, about 15 million spectators see the Blue Angels perform at some 70 air shows in 34 locations across the United States. Each year in May and June, the Blue Angels aviators make key stops on their annual tour in the D.C. area. Since their founding in 1946, the Blue Angels have performed for more than 260 million spectators. The Blue Angels' stated mission is "to showcase the pride and professionalism of the United States Navy and Marine Corps by inspiring a culture of excellence and service to country through flight demonstrations and community outreach" through visits to schools and hospitals at each place they perform. The Blue Angels must train hard and spend much of the winter practicing flight at the Naval Air Facility in El Centro in California. Every January through March, each aviator must fly 120 training missions (two practices a day, six days a week) in order to perform safely. This achieved, they fly home to Pensacola and continue practicing there and on the road throughout the show season. The Blue Angels air shows demonstrate the choreographed flight skills required to be a U.S. Navy pilot. The Flight Demonstration Squadron shows include graceful, fast-paced aerobatic maneuvers of two, four, and six planes flying in formation. The presentation also includes four-plane, acrobatic maneuvers referred to as diamond maneuvers and a six-jet formation known as Delta Formation. Solo pilots will also demonstrate high-speed and low-speed stunts. A Blue Angels performance features the team’s six core Boeing F/A-18 Hornets, its U.S. Marine Corps Lockheed C-130T big transport plane ("Fat Albert"), and the U.S. Air Force's technically advanced F-22 Raptors. The highest Blue Angels maneuver performed in an air show is carried out by a solo pilot who ascends up to 15,000 feet to perform vertical rolls. Meanwhile, the lowest maneuver performed in an air show is the dangerous Sneak Pass, which the lead solo executes at only 50 feet above the ground. Each aircraft leaves smoky contrails—harmless, wide vapor streaks in the sky. The trail of smoke is produced by pumping biodegradable, paraffin-based oil directly into the exhaust nozzles of the aircraft where the oil is instantly vaporized into smoke. It provides an obvious path for spectators to follow and enhances the safety of flight by providing a means by which solo pilots can see each other during opposing maneuvers. The contrails pose no hazard to the environment. From May 18 through 25, 2018, the U.S. Naval Academy's (USNA) Commissioning Week comes to Annapolis with an air show over the Severn River on the USNA campus on May 23 and 24 and a graduation flyover at the Navy-Marine Corps Memorial Stadium on May 25. Just a few days later on June 2 and 3, the tour will continue to the Naval Air Station (NAS) in Maryland for the annual Patuxent River Air Expo in the town of the same name. 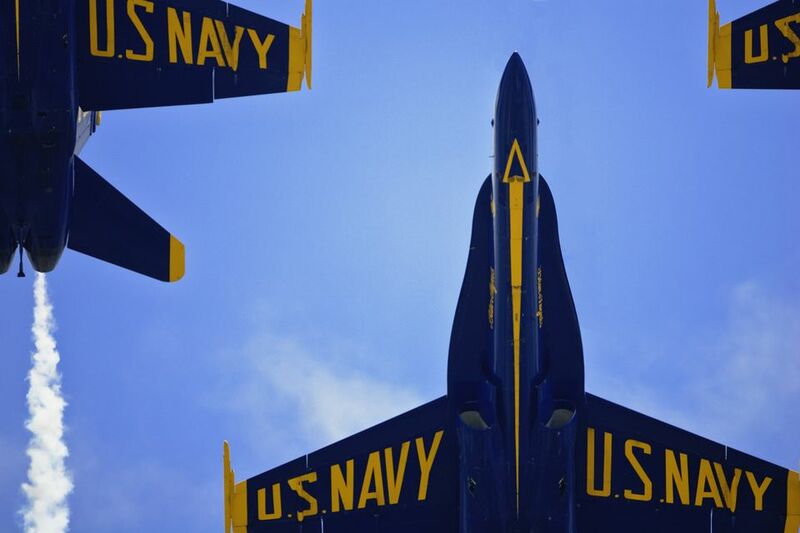 The 2018 airshow schedule for the U.S. Navy's Blue Angels also features stops in all over the United States—from El Centro, California to Providence, Rhode Island and Fargo, North Dakota to Houston, Texas. While each show is different in its own way, there are a few things you should expect no matter where you catch the Blue Angels in flight. Each May, visitors flock to downtown Annapolis, Maryland to watch the Blue Angels perform. These top pilots carry out aerial demonstrations over three consecutive days during the annual USNA Commissioning Week. The two-day U.S. Naval Academy air show takes place the first two days, and the graduation flyover at the Navy-Marine Corps Memorial Stadium in Annapolis closes out the week. The first day is typically reserved for a two-hour, midday flight rehearsal, and on the second day, the Blue Angels carry out a two-hour, 15-minute flight demonstration with all the skills at their disposal. Crowds gather on the banks of the Severn River on the USNA campus to witness the Blue Angels' amazing aerial performances. The time-honored USNA graduation flyover occurs on the final day to honor the approximately 1,000 midshipmen (officers in training) who graduate from the U.S Naval Academy each year. After the officers receive their commissions as ensigns in the U.S. Navy or second lieutenants in the U.S. Marine Corps, the Blue Angels soar above the Navy-Marine Corps Memorial Stadium to congratulate the new graduates. In 2018, the Blue Angels will perform at the Patuxent River Expo on June 2 and 3 at the Patuxent River Naval Air Station in Maryland. This is intended as a free and open event for the entire community, and the Blue Angels' top Navy and Marine pilots will put on demonstrations both days. Such performances usually include a wide variety of military demos featuring the Navy's core Boeing F/A-18 Hornet, the US Air Force's highly advanced F-22 Raptor, the US Marine Corps MV-22 Osprey, and the A-10 Warthog. Very often, shows also feature the Army’s Special Operations Command Parachute demonstration team—the Black Daggers—and the Legacy Hornet Tac Demo F/A-18 Hornet Demonstration Team. Civilian acts usually include the Geico Skytypers; the only civilian-owned AV/8B Harrier; Joe Edwards’ B-25 bomber "Panchito;" astronaut Joe Edwards, who performs in his T-28 Trojan; Charlie VandenBossche in his Yak -52; and Scott Francis in the MXS. The Boeing F/A-18 Hornet is the core aircraft of both the Blue Angels and the U.S. Navy fleet in general. The Blue Angels currently have 12 jets: 10 single-seat F/A-18 A models and two 2-seat F/A-18 B models. The team has flown more than 10 different aircraft in its 65-year history. The F/A-18 Hornet can reach speeds just under Mach 2, almost twice the speed of sound at about 1,400 miles per hour. An F/A-18 weighs about 24,500 pounds, empty of all ordnance and aircrew and costs just about 21 million dollars to acquire. Until 2017, the Blue Angels flew McDonnell Douglas F/A-18 Hornets, but in 2016, Boeing agreed to convert Boeing F/A-18E/F Super Hornets for them. Blue Angels air shows also feature the U.S. Air Force's technically advanced stealth tactical fighter, the Lockheed Martin F-22 Raptor, which is their newest fighter aircraft. Its combination of stealth, supercruise, maneuverability, and integrated avionics represents an exponential leap in warfighting capabilities. The Raptor performs both air-to-air and air-to-ground missions, making it a fighter aircraft for the 21st century and quite impressive in the shows. What's Hot for the Winter Theater Season in Washington, D.C.? Enjoy a New Year's Eve Concert or Show in Washington, D.C.